In February this year I was invited to attend an event: Twelve Uses for Twelve Empty Streets, being organised at the Saabat Gallery in South Bank. 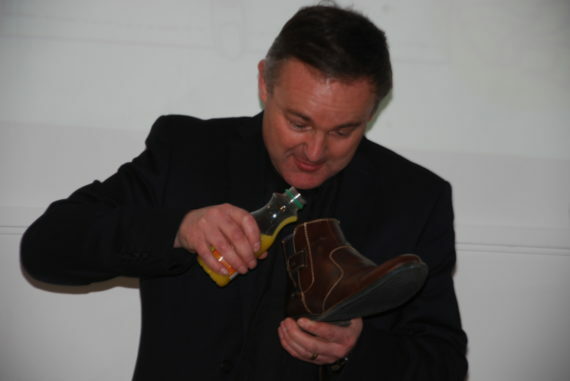 I have had some peripheral involvement in the area over the past year, having been invited to work with a group of local residents towards developing a community led housing group. South Bank is located just to the south of the Tees and what could be the new Freeport of Teesside if the plans supported by the new Teesside mayor come into effect. However, in the meantime, the future of the area remains uncertain. Depopulation has been fuelled by demolition, and faltering attempts to revive a local housing market with small, infill developments of new housing have served to highlight the economic marginality of the area. Against this backdrop, however, the local community, inevitably fatigued by repetitive cycles of consultation, continue to push forward with projects that draw on the loyalty and inimitable capacity of local people. It is exactly this capacity that Stratford’s project draws out and illustrates in beautiful diagrammatic form. Stratford’s project is part of Transitions17 residency, funded by Arts Council England and established by artist Adrian Moule in collaboration with the local Saabat Gallery. Set up as a year long programme with four resident artists, the residency is intended to engage local people in the processes of making their local community. It builds upon a wider programme of community-engaged arts projects in the Teesside area, led by MIMA’s ‘useful museum’ and Creative Community Programme and projects such as Isabel Lima’s ongoing work with refugees and asylum seekers in Middlesbrough. The first sessions of Stratford’s residency entitled: Organisational Diagrams for Everyday Life were held at a variety of places across South Bank, including the local library, supermarket and Art ‘n’ Craft Social meeting at St John The Evangelist, Anglican church across the road from the gallery. 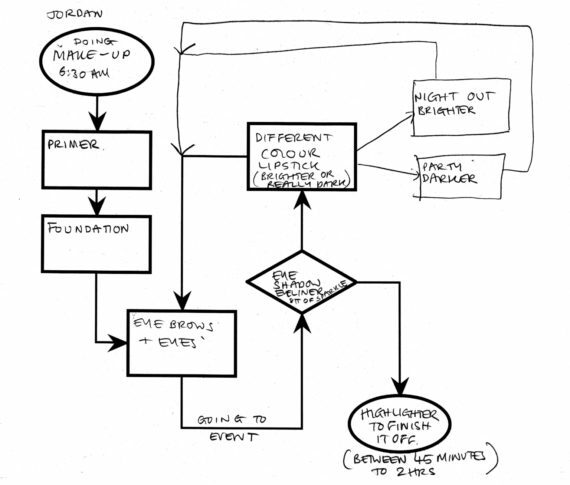 Stratford invited participants to make their own organisational diagram for something that they do everyday, week or month. The subjects varied from making marmalade and doing make-up, to deciding whether to stay in or go out, presented as intriguing forensic journeys through everyday decisions and processes. Displayed, as they were alongside Stratford’s architects toolkit they gained a more powerful resonance, highlighting the intricacy and complexity of those processes, quite at odds with the default assumptions about everyday life contained within design guides and development policies. The event that I attended was the second in the series. Twelve Uses for Twelve Empty Streets invited (12) participants on a walk around the South Bank. 12 Streets that were cleared as part of one of the various renewal programmes, remain with their streetlights and pavements. The plots where the houses used to be have been turfed over. As we walked the streets we were invited to imagine things that could be done with those streets. Some were whimsical and imaginative (Tibetan prayer flags on the lampposts). Other suggestions were practical and community focused (a basketball tournament, allotments). When we returned to the gallery with our list we were met by Lyn who had encountered Stratford in Tesco’s and then visited the gallery, where a discussion about communities evolved into her own personal diagram. Lyn talked us through her ‘pie chart’, telling the story of her grandparents who used to make pies and take them down to the dockyards every Saturday morning. 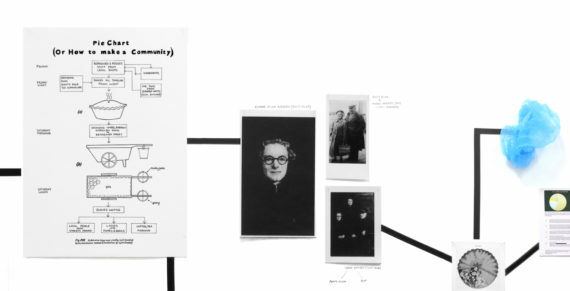 Her diagram perhaps more than any other captured the significance of these everyday events and the individuals at the centre of them – a process about making a pie that was also about making a community. 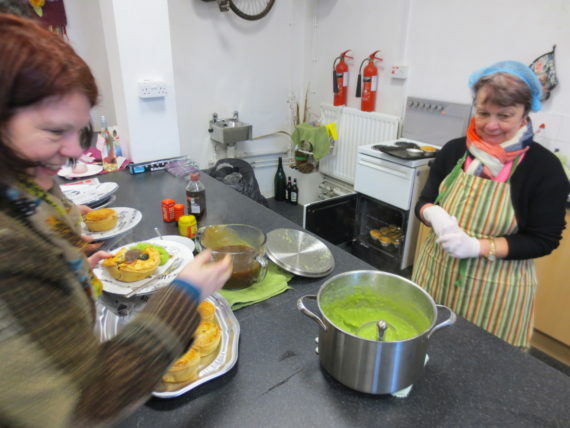 As a fitting end to the morning, our little collective of 12 artists, architects and local community organisers were treat to a hearty lunch of warm, vegetable pies made by Lynn and Adrian, served up in the gallery kitchen. Party bags were also handed around, complete with beautiful prints of Lyn’s ‘Pie Chart (or How to Make a Community)’ diagram. The notion of a community made through actions and connections continued into the concluding event at the gallery. ‘Magic South Bank’ was an evening event that combined a magic act by Father Terry Leathley from St John’s church, a talk by Stratford on Architects’ Sleight of Hand and an exclusive screening of previously unseen footage of a young Paul Daniels, former resident of ‘Slaggy Island’ (South Bank’s local name) in action in a local hall, courtesy of the North East Film Archive. 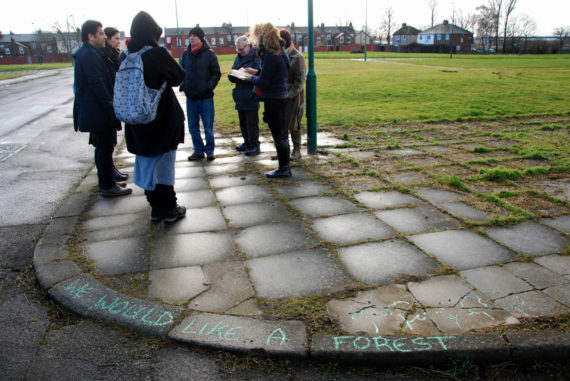 There were also screenings of documentary footage of Twelve uses for Twelve Empty Streets and a walk Heritage Walk of Historical Maps of the Future (or unrealised revisioning exercises) organised during the residency, led by local history expert John Chilvers. The footage was made and edited by Abboud Mahjoub, a Syrian refugee living in South Bank with skills in video editing. The evening also offered an occasion for the launch of an artists’ book or Productivity Portfolio made by Stratford and modelled on a sort of life guide, containing the diagrams made during the residency for others to leaf through and take advice from. Ultimately, in the book as in South Bank these networks of memory, actions, people and place exceed the diagrammatic methods that have been applied to the area, offering new conversations and starting points that recognise and build on productive lives being remade everyday.